The 2012 UCI Para-cycling Track World Championships began today at the Home Depot Centre velodrome in Los Angeles, and Canada grabbed their first two medals of the competition, with Marie-Claude Molnar and the Men’s tandem of Daniel Chalifour and Alexandre Cloutier taking bronze medals in their respective races. 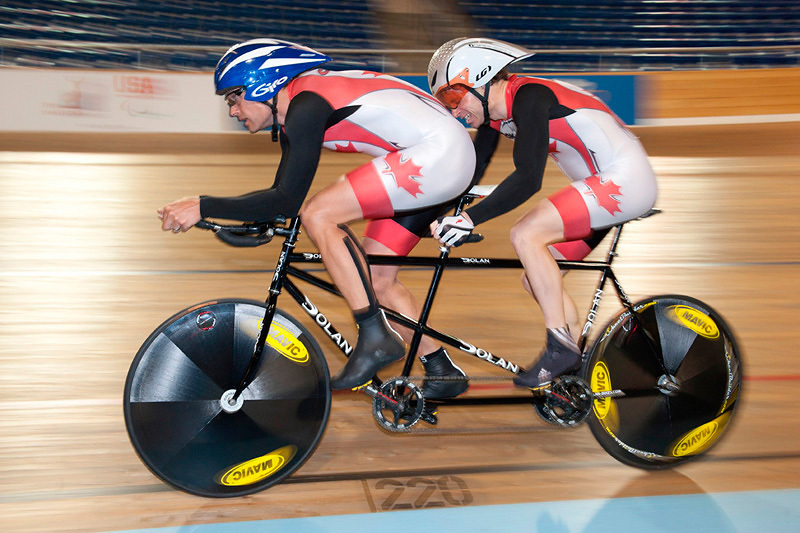 The Men’s tandem of Daniel Chalifour of St-Jérome, Quebec and pilot Alexandre Cloutier of St-Antoine-de-Tilly, Quebec, took the bronze medal in the 4000 metre Individual Pursuit, catching their Spanish competitors in the bronze medal race. The tandem qualified in third spot with a time of 4:27.837, just one second shy of qualifying for the gold medal race. “It was a super nice day for us. We are very proud of what we accomplished. We had really good training before coming here to Los Angeles. We trained in San Diego for about three weeks, and we have been constantly training for the last 15 months or so without big breaks. Managing fatigue and energy is critical, and today we had to deliver two big performances to get this result. Two pursuits in the same day, it can tear you apart. You really have to manage the efforts and the energy as the pursuit is a very technical race. This result is an excellent preparation for the Paralympic Games in London,” said Daniel Chalifour, moments after receiving his medal. At the 2011 edition of these World Championships, the Chalifour/Cloutier tandem finished fifth. The men’s tandem of Brian Cowie of Burnaby and Ed Veal of Toronto came in ninth, surpassing their top-ten objective. In the Women C4 500m Time Trial, Marie-Claude Molnar of Sainte-Adèle, Quebec, posted the third fastest time, a personal best time of 42.998 seconds to win the bronze medal. 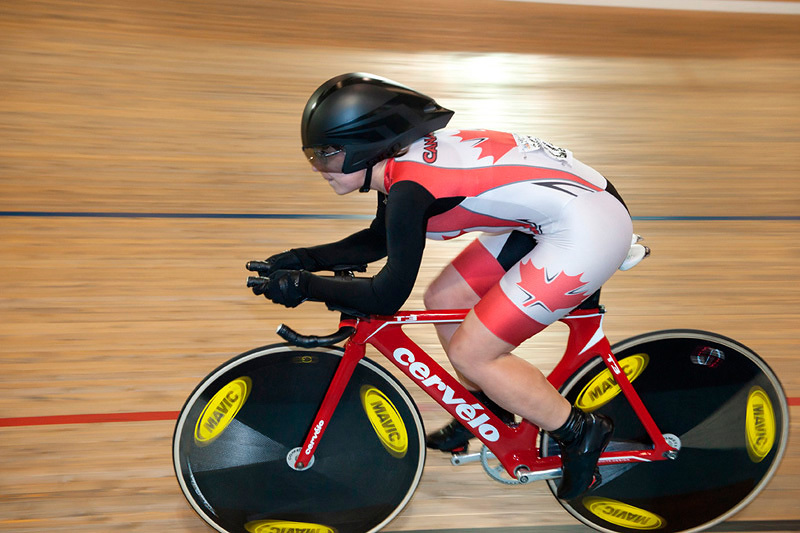 Molnar was riding for the first time in competition her new Cervélo T3 Track bike. In the same race, Chinese rider Jianping Ruan went on to break the previous World Record with a time of 38.974 seconds. “I am really happy with these results. My coach Eric Van Den Eyde has been instrumental in my improvements for the 500m TT, which has never been my strong discipline. The support from the entire staff here is exceptional. I rode my new Cervélo T3 bike today, and it really helped me to improve my times,” said Molnar after the race, who improved by two spots over her 2011 results. In the Women’s tandem, the Pan-American gold medallist tandem of Robbi Weldon of Thunder Bay, Ontario, and Lyne Bessette of Knowlton, Quebec, finished eighth of the qualifying round with a time of 3:50.194. In this first day of competition, Canada equalled the total number of medals won at the 2011 edition of this event, showing significant improvements made by the team over the last year, within a few months of the Paralympic Games in London this summer.